Offering you a complete choice of products which include commercial mosquito killer 30 w, mosquito fly insect killer 39 w, mosquito killer machine 30 w and mosquito killer lamp. An electrical discharge insect control system is a device that attracts and kills flying insects that are attracted by light. A light source attracts insects to an electrical grid, where they are electrocuted by touching two wires with a high voltage between them. Electric Fly killers utilize ultraviolet tubes to attract flying insects into the product, before zapping them dead on a high voltage killing grid. UV tubes attract flying insects by emitting a wavelength of light attractive to flies. Flying insects are attracted to the tube which emits UV at a level comparable to that of the sun, which the flying insect has a natural attraction to as a source of heat.Electric fly killers use UV light to attract flying insects to the unit, then use a killing grid to kill the insects, before retaining them in a catch tray to allow hygienic disposal The Wantrn Ultimate Insect Killer Machine features two powerful 15W bulbs that combine for 30W of zapping power. This Device comes with a removable collection tray for easy, no-mess disposal of bug remains. This eliminates an unsightly buildup of bug remains on your floor or counter and keeps your establishment clean, sanitary, and bug-free! Hang the Insect Killer by attaching the enclosed chain to the hooks on the top of the unit, or set it on a solid surface. 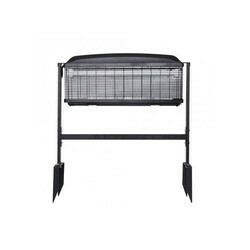 Place the removable, washable plastic tray on the bottom of the unit to collect any dead insects as they fall. When the tray is dirty, switch the device to off, remove the tray, slide the insects into the trash, wash and dry if necessary and replace. The electrical grid is self-cleaning. You will only need to clean the tray. Switch on the machine on 2 hours before you sleep. This way it is ready to do its work well all through the night. Place the Machine in a part of the room where it is not directly under a fan and is away from drafts. Product should be placed in a relatively undisturbed part of the room, with no obstructions around it, to allow for free circulation of air. 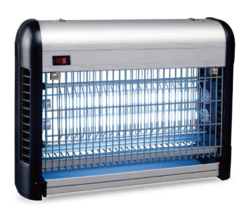 In a dark and static environment, the Trap catches mosquitoes quite fast and gives best results, so all lights should preferably be switched off when using the machine. This item is arc shape with artistic appearance, equipped with SUPER UVA which uses Philips technology,30% more effective in attracting flying insects. This product is highly effective in killing insects, fashionable and safe, which can create a pest-free living space for consumers, avoiding the risk of Dengue fever and other kinds of diseases. Usage/Application Garden, Home, Hotel, Office, Hospital, etc. Health: nox-toxic, non-chemical, sanitary, as soon as you use this device, you can say bye-bye to the mosquito repellent incense, let your family (including parents and children) easy bye-bye to mosquito. it attracts mosquitoes by the carbon dioxide produced by the photo catalytic reaction made by the UV light and photo catalytic agent. 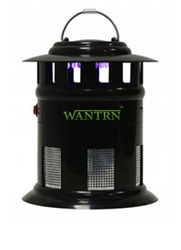 it kills mosquito by dehydrating and air-dried . the drought fan spinning speedily stir the air around to whirlpool which drag the mosquitoes to the bottom to dehydrate and air dry the mosquito to death. Environmental: this device also can kill various toxic and hazardous viruses in the air. absorb various toxic and hazardous gas in the air such as formaldehyde, benzene and so on. UV (Ultraviolet) Light is not visible to the human naked eye. In the light spectrum, it can be located slightly to the right of visible light. UV Light can be categorized into 3 general spectrums, UV-A, UV-B and UV-C. They are categorized by their wavelength measurements in nanometers (nm). The wavelength of UV Light lies between 100 to 400 nm. 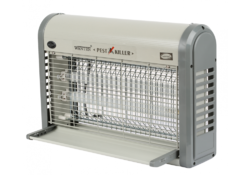 Place the Mosquito Trap in a part of the room where it is not directly under a fan and is away from drafts. The Trap should be placed in a relatively undisturbed part of the room, with no obstructions around it, to allow for free circulation of air. In a dark and static environment, the Trap catches mosquitoes quite fast and gives best results, so all lights should preferably be switched off when using the Trap. Switch the Trap on 3 hours before you sleep. This way it is ready to do its work well all through the night. The Adapter that goes into the power point in your wall is a sophisticated gadget. Make sure it does not get accidentally pulled out while the Trap is on with regular use, the Trap will also begin to pull out and kill all mosquitoes hidden behind the curtains, furniture or in the nooks and crannies of your room.